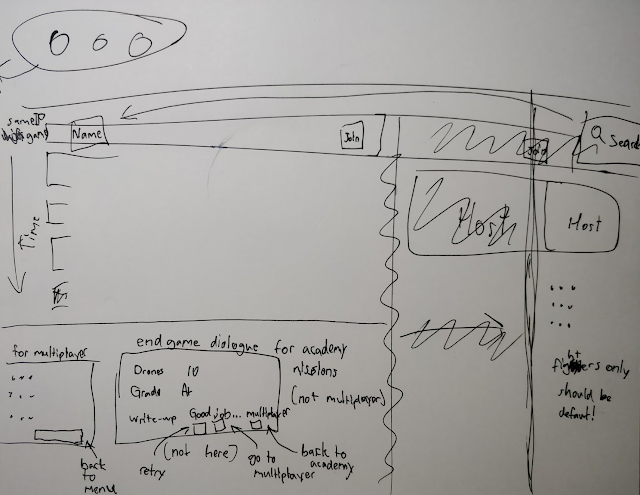 Yesterday I detailed the changes to the main menu that we're making, and as we're now in the refining and bug fixing stage of development of version 0.7.2, I thought I'd show off some of the thinking we did before deciding on this final iteration. Yes, I have pretty bad handwriting, but let's not dwell on that. What's more important is the content of the sketch. Other than the current design of the tab, you can see a search button, which we didn't feel was necessary at this point in time. 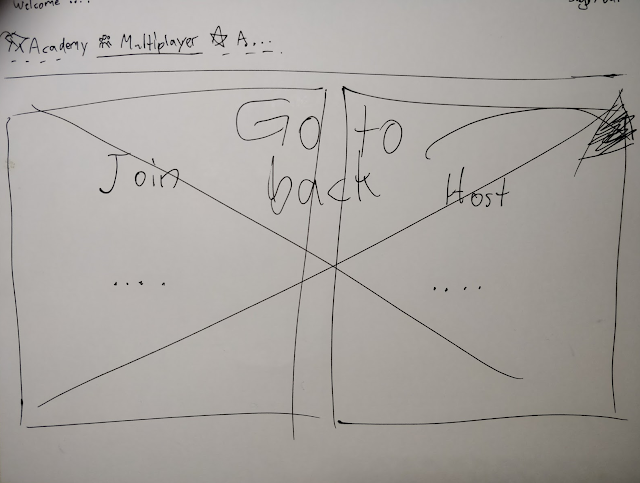 There is also a sketch of new options at the bottom of the end-game dialogue, 'Retry' and 'Go to Multiplayer'. This should make the transition between learning at the Academy to playing multiplayer less confusing. A small change you can see written (badly) on the right was that we had to make the hosting menu have fighters only as default, as someone who just finished Fighter Certification shouldn't have to find out the hard way what a battleship is. Our original design idea was to basically just put the two tabs in a new tab. We'd have the old 'Join' tab and the old 'Host' tab accessed through buttons under the 'Multiplayer' tab. They'd just be massive buttons that filled half the screen each, with the text 'Join' and 'Host' followed by a short description of what that button was for. That solution was fine, but it could be condensed and optimized further. People who wanted to join a game had to press one more button before arriving at the game list, even if it seemed more clear. Like I showed off in yesterday's blog post, the new screen looks like the old 'Join' tab, but with a 'Host' button and a description as to what hosting is and who should do it.